AVONDALE — Freshly-patched bullet holes dot the lobby walls at Entowne Manor in Avondale, a daily reminder of the property’s violent reputation. Blocks away, building code violations have mounted at the Burton Apartments where just this month dozens of families had to be bused to a nearby hotel after their roof caved in following a heavy rain. And in neighboring Walnut Hills, leaking ceilings, bed bugs, broken elevators and a growing list of safety concerns plague tenants at The Alms. “They’ll do band-aid jobs here and there, but the problems are getting worse, not better,” said Charles Williams, a seven-year resident at Entowne Manor. As city leaders work to tackle crime and blight in Cincinnati’s most troubled neighborhoods, apartment communities like Entowne, Burton and The Alms are among the top challenges they face. 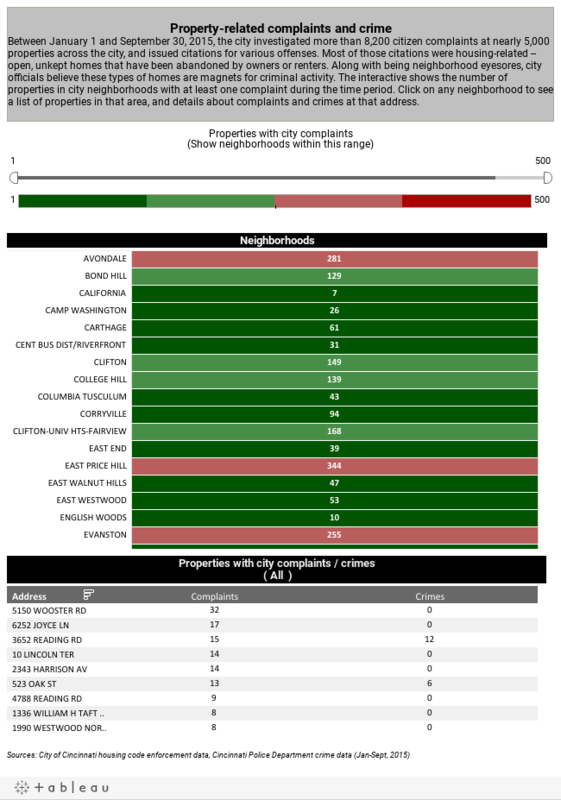 Check out the interactive below to search problem properties by Cincinnati neighborhood. The troubling list of living conditions at each of the buildings spread far beyond their front doors, officials say, and put at risk the city’s most fragile housing supply: low-income rental communities that are home to hundreds of Cincinnati’s poorest residents. The buildings are among nearly a dozen properties purchased by New Jersey-based PF Holdings LLC in 2013. The deal ensures the out-of-state landlord gets more than $5.3 million annually from taxpayers to offset the costs of rents for nearly 1,000 Cincinnati residents. Additionally, each tenant pays at least 30 percent of their income toward rent. PF Holdings attorney Steven Rothstein contends the owners have invested "hundreds of thousands of dollars" to repair a host of issues they inherited when they purchased the properties more than two years ago. "Every spare dollar that the ownership has over and above the mortgage, taxes and insurance is being devoted to maintenance," said Rothstein. 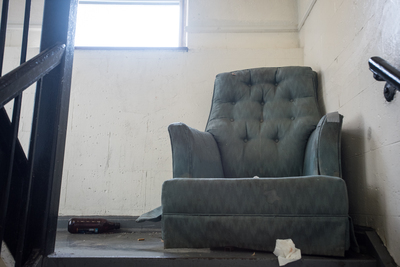 A chair and some trash sit in a stairwell in Entowne Manor (Phil Didion for WCPO). But even as the rent checks come in, half of the buildings owned by PF Holdings have made their way onto the city’s nuisance property list, accounting collectively for more than 2,700 police calls and a growing tally of health and safety code violations. As the problems have escalated, PF Holdings has become the target of a city lawsuit. City health and safety officials claim the investors and managers have ignored criminal activity, kept police from entering the buildings to investigate crimes and have “willfully” concealed building hazards to cover up unsafe living conditions at six of its properties. Rothstein says a negligent property manager hired by PF Holdings to maintain the properties is largely to blame. That firm has since been replaced by Skyview Property Group and "substantial progress has been made in addressing all of the most serious allegations related to safety and security," said Rothstein said. "We're getting on top of the remaining issues," he added. City of Cincinnati attorney Mark Manning disagrees. Aside from Entowne, Burton and The Alms, other properties named in the lawsuit include: Shelton Gardens at 2000 Westwood Northern Boulevard in English Woods, Reids Valley apartments at 1990 Westwood Northern Boulevard in English Woods, and St. Claire Manor at 705 Reading Road in Avondale. All told, the buildings account for nearly 800 units of affordable housing. “We have a lot of resources dedicated to the issue, but there’s never enough,” Muething said. It’s rare that a day goes by when police aren’t called to Entowne Manor on Reading Road. In the last two years, cops have made more than 720 runs to the Reading Road apartments, including calls for a homicide, six felonious assaults, one sexual battery and a shooting. Entowne Manor resident of seven years, Charles Williams, explains the issues with the building. Williams suggests that having windows in the inner doors would prevent getting ambushed as one walks through the building (Phil Didion for WCPO). Often, the crimes are committed by people who don’t live at the apartment complex, said Jessica Powell, assistant city solicitor for Cincinnati. “(The residents) are victims in many cases,” she said. In recent months, the owners have installed security cameras, but in spite of police urging, no security staff is in place for the nearly 100 families living there. Getting the problems solved requires months of sifting through legal filings just to track down landlords who have created complicated networks of limited liabilities companies that serve — on paper — as the properties' owners, Boggs Muething said. The 12 buildings PF Holdings owns across Cincinnati are each listed under separate LLCs. “We’re trying to play this game of piercing the corporate veil every with every single statutory agent that we run across,” Muething said. When property owners are out of state, the city faces the added hurdle of convincing the owners to come to Ohio — or finding them when they do — so they can serve them the legal paperwork that will jump-start court actions and sanctions. Further complicating the challenge, city lawyers say, is lack of cooperation from the federal government, which pays out hundreds of millions of dollars annually to landlords like PF Holdings. Through the U.S. Department of Housing and Urban Development, investors like PF Holdings contract with the federal government to buy and operate the housing, receiving monthly payouts for each occupied apartment they manage. For PF Holdings, those contracts amount to more than $5.3 million annually, according to documents obtained by WCPO from the U.S. Department of Housing and Urban Development. “HUD is in the best position to fix this problem, because they control the money,” said Ed Cunningham, Cincinnati’s property code enforcement division manager. Owners are required to follow federal guidelines aimed at ensuring residents are living in safe and affordable housing, but PF Holdings properties are proof that not all do, Muething said. “HUD has not been a partner,” she said, adding that the federal agency has rejected the city's requests to allow them to come along on housing inspections. In the last year that Cincinnati has pursued court sanctions against PF Holdings, HUD has “not been willing to coordinate a response or even really sit down and strategize with us about how to get compliance on the properties,” Muething said. Officials with HUD did not return messages left seeking comment for this story. After more than a year of costly legal work and court filings, Cincinnati and PF Holdings will face off in court next month. A hearing is scheduled for Dec. 16. The city is asking the court to declare each of the properties a public nuisance, order the problems fixed and put a receiver in place to manage the properties until the concerns are addressed. Before the hearing, city attorneys were supposed to conduct a round of inspections alongside HUD in each of the properties at the end of this month. But HUD pushed those dates back until next year. PF Holdings attorney Rothstein reiterated that his clients are already working to tackle the problems. "(PF Holdings has) no interest in litigation," he said. "They are interested in fixing the problems and making the buildings habitable and comfortable for the tenant. The only kind of successful business model there is, is one where you keep the customers happy." Still, some city officials say the PF Holdings case is so egregious more legal action is likely required. "Maybe we have to sue HUD for not doing their job," Councilman Kevin Flynn said. "It seems like the federal government is this mountain that is impossible to climb. For these residents who are living this day and night, we need to demand that HUD listens to us. We can't put up with this anymore."